The Uruguayan was harshly sent off in the closing stages as the Catalans edged out Atletico, but improvement is needed if they are to claim the trophy. It was a game that had everything. Disallowed goals, red cards, a missed penalty, controversial incidents and plenty of drama. In the end, Barcelona came through it to make the Copa del Rey final for the third year running. But they barely deserved it. Luis Enrique's side beat Atletico Madrid 2-1 in the sides' first meeting at the Vicente Calderon last Wednesday, when magical moments from Luis Suarez and Lionel Messi proved enough to win the match despite a plucky performance in which the home side impressed - especially in the second half. And if anything, that happened again on Tuesday. After Atletico had missed chances in this match, a mesmerising run from Messi ended with a shot which Miguel Angel Moya could only push into the path of an unmarked Suarez to make it 1-0. Atletico saw a goal ruled out in the second period when Antoine Griezmann netted but was wrongly ruled offside and, later on, Kevin Gameiro blasted over the bar after the Rojiblancos were awarded a contentious penalty following a challenge by Gerard Pique. As throughout much of the tie, Atletico were on top. That has not always been the case this season, perhaps the most disappointing campaign during Diego Simeone's spell in charge at the club, but his side have played their best football this term versus Barca. Atleti were a man up following the dismissal of Sergi Roberto (on his 25th birthday), but Yannick Carrasco then also saw red and Barca ended the match with nine players after Suarez was absurdly given his marching his orders as well. "I have to laugh at the sending-off," Suarez told the television cameras after the match. "We could see it coming. The first yellow was for the first foul I made in the match and the second one wasn't even a foul." 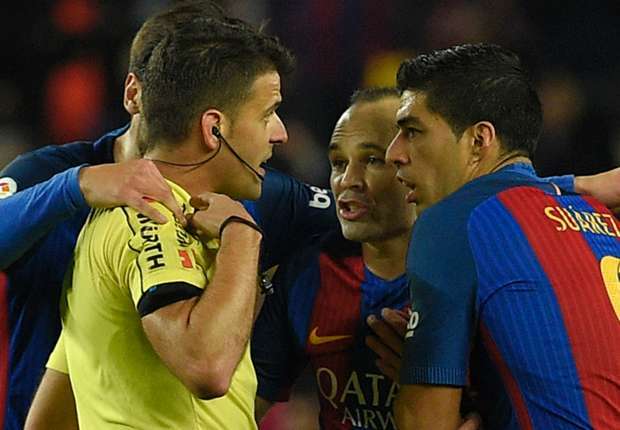 So while Messi, Jordi Alba and Samuel Umtiti managed to avoid a yellow card which would have seen them miss the final against Alaves or Celta Vigo on May 27, both Sergi Roberto and Suarez will be suspended for the showpiece cup clash. Aleix Vidal, who was about to come on for Sergo Roberto before the latter's dismissal, can fill in at right-back following his excellent performances in recent weeks, but losing Suarez is a big blow for Barca and Luis Enrique. The Uruguayan scored two of the Catalans' three goals in this tie and he is a big reason why Luis Enrique's side are in the Copa del Rey final for a third season in a row. "Barca should appeal," the Asturian coach said after the match, although he was also pessimistic about the chances of that being successful as he added: "Look what has happened in the past." The Barca boss also complained about his team's inability to retain possession. "It's not normal to lose so many balls," he said. "We have to look at that, although I have complete confidence in my players' ability to improve." They will have to. Because even though Barca should beat Alaves or Celta at a neutral venue yet to be decided as usual, the team will be weakened by the loss of Suarez and the probable presence of Paco Alcacer in his place. Without their deadly striker, the Blaugrana will need to do much, much better than this. 0 Response to "LUCKY BARCA WILL NEED TO BE MUCH BETTER AFTER LOSING SUAREZ FOR COPA FINAL"